It would be understandable to expect the foliage of a plant called Anise-Scented or Anise-Leaf Sage (Salvia guaranitica) to smell robustly like licorice, which shares the same fragrance as anise (Pimpinella anisum). However, while some gardeners detect a hint of licorice after crushing a leaf of S. guaranitica, many say the foliage merely smells sweet. Yet three things are certain about all forms of Anise-Scented Sages. First, they are pretty. Second, hummingbirds love them, and some of these sages also attract honeybees and butterflies. Third, many true types of this species have tuberous roots similar to those of Dahlias and Gentian Sages (S. patens). The tubers are fleshy but also brittle, which makes them difficult to divide. Gardeners in areas with cold-winter climates sometimes lift clumps in the autumn to overwinter in a cool, dark basement area. Hummingbirds are well known for favoring bright red and orange tubular flowers. But they also adore the pale blue to purple flowers of the S. guaranitica group, which is native to South America. Hummingbirds only live in the Western Hemisphere. As New World species, they prefer Salvias from their half of the globe. Anise-Scented Sages fit the bill, so to speak. In 2011, we grew seven varieties of these sages, including the longtime favorite Black & Blue Anise-Scented Sage (S. guaranitica 'Black & Blue'). It's famous, in part, for dramatic contrasts in color: mid-green foliage, deep violet-blue flowers, black stems and black calyxes cupping the blossoms. Now we offer double the choices and have added only the most vigorous, long blooming kinds to our catalog. These include the 2016 FBTS hybrid BODACIOUS™ Rhythm and Blues Sage (S. x guaranitica 'Rhythm and Blues'), which we recommend as a sturdier, longer blooming replacement for the Black & Blue variety. One problem associated with Black & Blue is its vulnerability to breakage due to its completely herbaceous (soft tissue) foliage. In contrast, BODACIOUS™ Rhythm and Blues FBTS combines strong, woody stems with soft herbaceous growth. Aside from being for sale through FBTS, it is trademarked by our representative Plant Haven and will soon be available at Lowe's home improvement stores through Monrovia. Other new varieties of S. guaranitica now available from FBTS include Elk Magenta Hybrid Sage, Jean's Jewel Sage, Purple Haze Sage and Elk Argentina Skies Anise-Scented Sage (an FBTS improved form of the Argentina Skies variety). All are detailed below. Anise-Scented Sage is native to Argentina, Brazil, Paraguay and Uruguay. In the wild, it grows on the edge of streams in woodland clearings. Although it loves water, it does well with an average amount of supplemental watering dependent on local rainfall. Another reason for the popularity of the Anise-Scented Sage group is the species' adaptability to a wide variety of soils, including ones that are damper than most Salvias prefer. As to sun exposure, these sages tolerate heat and partial shade. They grow well in full sun in coastal areas with generally moderate temperatures. But partial shade is necessary where summers are particularly hot. Some types of Anise-Scented Sage can survive winters in USDA Plant Hardiness Zone 6, which means they can handle temperatures down to -10F. However, others need warmer winter weather. Finally, if you live in an area where deer wander through your landscape, don't worry too much about them munching on sages. It takes a desperate deer to acquire a taste for any kind of Salvia foliage, which contains terpenoids -- the turpentine-like chemicals that make so many sages aromatic. The complete scientific name of Anise-Scented Sage is Salvia guaranitica A. St.-Hil. ex Benth. The "A. St.-Hil." stands for French plant explorer Auguste François César de Saint-Hilaire (1779-1853) whom the Smithsonian Institution identifies as collecting the species in Brazil and submitting its name for publication. "Benth" refers to British botanist George Bentham, in whose book, Labiatarum Genera et Species, the name was published. The "ex" part of the name refers to the fact that Bentham found something at fault in the naming process and corrected it. Who knows what? This is where the history of the naming gets murky. Tropicos -- the online botanical database of the Missouri Botanical Garden -- also confirms Saint-Hilaire's scientific name and his role as author. 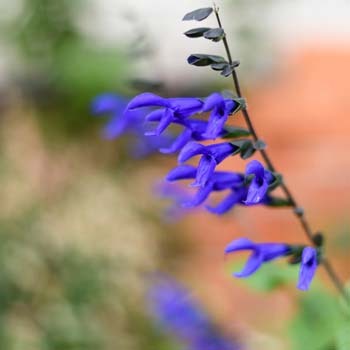 However, Kew Royal Botanic Gardens records the accepted name as being Salvia coerulea Benth., which would indicate a belief that Bentham was the first to name the species. (It also explains another of the common names, Blue Anise Sage, because coerulea is Latin for "blue.") Kew says Bentham's name for the species was published in the same year and publication as Saint-Hilaire's post. Kew lists Salvia guaranitica as a synonym, which would mean that it was published subsequent to S. coerulea. In contrast, Tropicos says Bentham's name is a synonym. Here's what we know: The dominant name is Salvia guaranitica. Plus, Saint-Hilaire traveled through parts of Brazil where he would have met the indigenous Guarani people who chewed on the plant's leaves as a sedative. The species name "guaranitica" means "of the Guarani." We're neither geographers nor historians. Yet from what we can piece together, Saint-Hilaire probably found S. guaranitica and the Guarani people in a part of Brazil bordering the Misiones Province of northeastern Argentina. For a look at Misiones Province, which includes Iguassu Falls (no adjectives do it credit), and an introduction to the modern-day Guarani, we recommend the documentary work of ethnomusicologist Jason Rothe. As Rothe notes in his videos about the Guaranis, their central philosophy is to strive as a community to "walk toward the path of no evil." All plant groups and their companion species are communities. The Anise-Scented Sage community is rooted in Guarani culture, but has spread its roots worldwide. Naming isn't the only confusing aspect of the S. guaranitica group. Sometimes it's difficult to make decisions about which variety to purchase. To make selection easier, we detail variations in flower colors and plant size below. To compare all the flower colors side by side, you can also make a quick trip to the S. guaranitica page in our Quick Look gallery. The following list is roughly organized by height and spread from the smallest to the largest plants, grouping them according to where you might place them in a border. Based on size, Anise-Scented Sages are middle-of-border and back-of-border plants. Anise-Scented Sages are part of the larger Salvia community of nearly 1,000 species around the world. Flowers by the Sea is strongly rooted in the global community of home gardeners, commercial growers, plant explorers and researchers fascinated by the Salvia genus. Our role as a Salvia specialist farm and online nursery gives us the background to answer lots of questions about sages and related species in the mint family. Please call or email us at FBTS if you need more information about our Salvias and companion plants. We'll be glad to welcome you to our community. The plant was packaged real well. It came alive without any wilted leaves. Now in a pot and surviving. Love it, can't wait until it gets bigger.